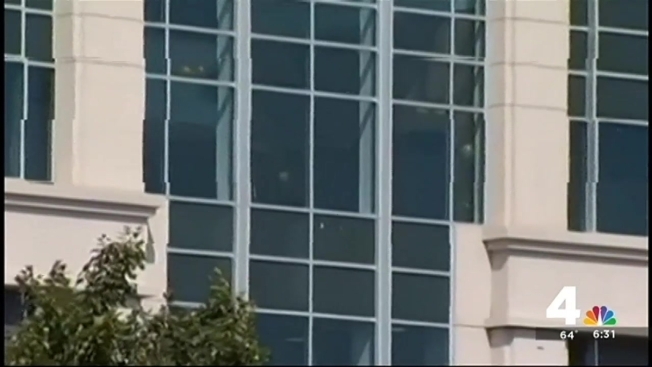 The bullets come flying into office buildings at night, after most employees have gone home. Now police believe as many as seven recent incidents could be connected. Six of the buildings that were hit are within a half mile of one another in the Herndon area, all of them just off the Dulles Toll Road. Some are high rise office buildings, their upper floor windows shattered. But in one of the most recent incidents, Sept. 2, a TD Bank along busy Elden Street was the target. Plywood still frames the broken window. The bank was one of two buildings hit the same night. Investigators now also believe the mid-August shooting out of a window at a Leesburg bank along the Dulles Greenway was also likely the work of the same shooter. The shootings started in late July. No one has been hurt, but in at least one case, some employees were inside when the bullets blasted through the windows. "Shooting into a building is a crime and a dangerous one at that because you can't know who is inside," said Officer Brendan Murphy, a Fairfax County police spokesman. Police urge residents to keep a lookout, hopeful they might spot suspicious activity that will lead to an arrest. The trouble is, few residents have heard about the incidents. "I haven't heard about it around here and that's really scary," said Herndon resident Brenda Brown. "What's going on today in the world?" Anyone with information about the shootings should contact Crime Solvers electronically by visiting www.fairfaxcrimesolvers.org, by texting “TIP187” and your message to CRIMES (274637) or by calling 1-866-411-TIPS (8477).